Sit on floor or mat with soles of feet together on floor and close to body. 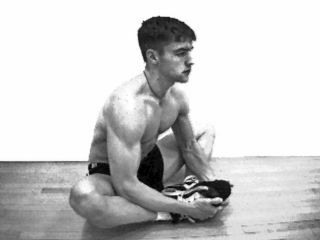 Grasp feet with both hands and position elbows on inside of lower legs. Press knees toward floor with elbows. Hold stretch. Erector Spinae may be stretched if spine is flexed during stretch. Gluteus Maximus may be stretched if hip is flexed enough.